Have you ever had a basket of chicken wings that knocked your socks off? One where you're sure the glaze and sauce will be too spicy for you, but everyone speaks so highly of them that you just have to try? The wings arrive and you dive in. They are delicious, but you’re starting to sweat and your face is flush with blood as you remember the four-chili rating on the menu. It’s too much, but darned if you’re going to put them down. Tangy and spicy with just the right balance! Not minding the runny nose and sweat dripping into your eyes, you lick your fingers clean and relish the suffering. The first stage—if I’m sticking with my metaphor—was the appetizer plate of jalapeño poppers. The breakaway escaped with relative ease and the pace steadily increased as the stage wore on. We were optimistic that it would come down to a small bunch sprint after the extreme final climb and did our best to support Michael Matthews to that point. The climb proved too much for him in the end, but that’s not too surprising when talking about kilometers-long stretches of nearly 20-percent grades. I had been dropped by that point, but the environment on the climb was superb. The sensory overload was insane: noise from the shouting and clapping combined with the smells of burning moto clutches and burning weed (I’d forgotten that was popular here! ), all while fighting cramps that threatened to seize me during every strained pedal stroke. 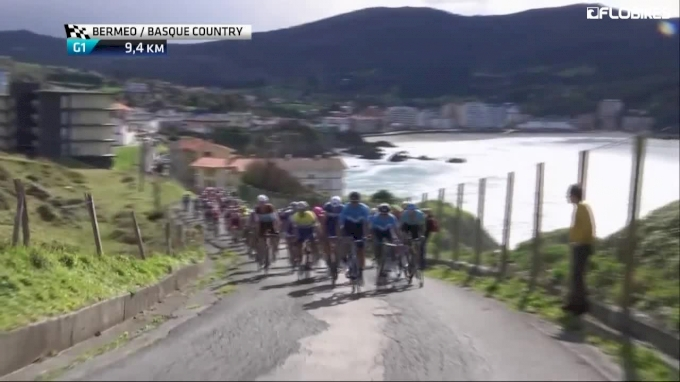 After all the hype of Pais Vasco, I was a tiny bit disappointed that the weather had been spectacular all day. “Welcome to Pays Bask!” my compatriot and fellow-Texan Lawson Craddock half-jokingly said. We were 60 kilometers into stage two and the breakaway had finally escaped. Half of the peloton was a minute behind us after splitting on a high-speed, rain-soaked descent, the gap widening as attacks continued for another 40 minutes. It finally came back together, but the pace remained stuck at “quite uncomfortable” for the rest of the day until things exploded on the last climb. Michael Matthews was feeling a bit more spritely and even attacked a couple of times, but the goat-path climb was again too much for our climbing sprinter. My legs had been less than spectacular, but that was a real bike race and I had a blast. Again the spectators relieved some pain with their infectious enthusiasm, and the buffeting wind and rain on the descent to the finish reminded me that I had survived a real stage of the race I’d heard so much about. As the only team willing to do the work to bring it to a sprint on the longest stage of the race—and an uphill, headwind stage at that—our work was cut out for us. The first order of business was getting a small, manageable break. 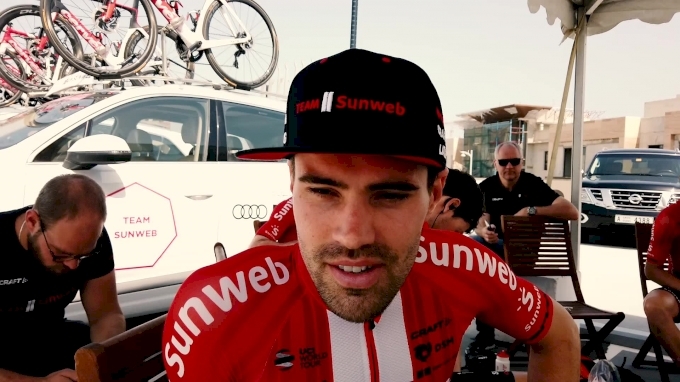 Our cap, if we could pull it off, was eight riders. If it wasn’t gone in the first 20 minutes before we reached the climbs, things would likely be out of our control. With help from Quickstep and Lotto-Jumbo, who wanted a respite from riding the front, eight riders were gone and the road was blocked. With the gap over a minute by the base of the climb, things were looking good until some riders broke through and the fireworks started again—because, Pais Vasco. 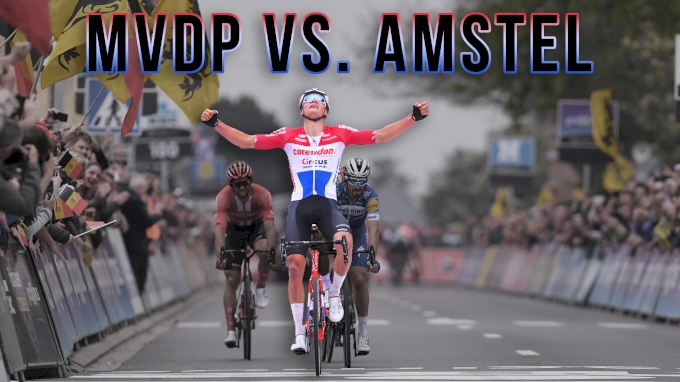 The fight would eventually end without any more riders joining the breakaway, but I guess at this race we like to suffer just to suffer. As the roll call of riders up ahead came through the radio, I had to laugh. It was eight riders, but we would be chasing some of the biggest engines in the peloton. I mean, just Thomas de Gent counts as four riders! With the unenviable task of chasing them back, we showed our commitment to the cause and set to work. Thanks to the unexpected contributions of Astana, the gap steadily fell (as did the rain, on occasion). After our veteran Laurens ten Dam and neo-pro Michael Storer were used up, I set to work. But I soon found that I wasn’t firing on all cylinders, and didn't last long. With the win in sight, the peloton came alive and finished off the chase, but Michael was left unsupported in the closing kilometers. He was not satisfied with his top-10 placing, but winners never are. The rest of us aren’t bothered; as long as we keep working like this, the results will come. Today was the time trial, featuring a course so flat that we had to travel to the outskirts of the region for it. Seeing the power file from the previous stage and noting that I suffered much more than the numbers would indicate, I doubted my legs’ abilities today. Nevertheless, I gave it everything. I never felt great, but I enjoyed the race and got everything out of my legs, even if it was only good for 22nd place. I crossed the line today with legs and lungs burning, snot on my sleeves, and seeing through sweat-covered glasses. Those were some spicy wings! Have you ever filled up too early at dinner, underestimating the size of the dishes you ordered? I’ve filled up on jalapeño poppers and three baskets of chicken wings, suffering all the while, and the table just shook with the arrival of the next course.